Get inspired by this cheerful spring colour! A bright rug is an inexpensive way to test out your yellow comfort level. In stylist Sabrina Linn’s bright entryway, a lacquered white hall table, unique drum light and white cube bench (with storage!) create visual interest. Hits of bright yellow in the flowers and striped rug perk up the space, as well. Watch an Online TV tour of this loft and browse photo galleries of the interior and patio transformation. Plus, see more sunny spaces in our photo gallery of 26 Happy Yellow Rooms. A mostly-white kitchen with fun pops of colour. Sunny yellow adds youthful flair. Find more inspiration in our photo gallery of Arren Williams’ Houses, as well as in our galleries of Colourful Kitchens and 26 Happy Yellow Rooms. Kitchen design and installation, The Home Depot; wall colour, Lemon Zest (SG-390), Behr; appliances, Maytag. Multitasking furniture is a smart use of space. A sectional sofa bed upholstered in a pretty Moroccan fretwork pattern is the perfect spot for daytime lounging, but by night it transforms this second-floor den into a cosy bedroom for visiting grandchildren or guests. Bowl, Snob; desk, chair, sofa, pillows, Anne Hepfer Designs; coffee table, West Elm; sconces, Circa Lighting. Raised panels add textural interest. Rather than chopping up walls with contrasting trim, these raised panels constructed from inexpensive MDF boards add visual textural interest when painted in one hue. Don’t worry about obstructing the panelling: by hanging artwork directly over it, it becomes a backdrop instead of a centerpiece. Find more inspiration in our photo galleries of Rooms With Painted-Out Trim and 26 Happy Yellow Rooms. Wall colour, India Yellow (66), Farrow & Ball; mouldings, Brenlo; settee, pillow, chair, Elte; lamp, Ikea; tables, Kantelberg + Co; rug, Ecarpet Gallery; artwork by Jacob Semiatin, 507 Antiques. Keep your living room feeling bright year-round with a sumptuous shade of yellow. For a daringly colourful look, pair with other warm colours like red, orange and gold. Find more inspiration in our photo galleries of Colourful Spring Rooms and 26 Happy Yellow Rooms. A piece of yellow furniture makes a fun statement. In the living room of his one-bedroom apartment, Tommy Smythe — associate designer with Sarah Richardson Design — took advantage of a bay window to create a cheerful dining area. For day-to-day use, this bright corner displays pretty curios and is home to a stunning arrangement created with a simple cut maple branch. Find more inspiration in our photo galleries of Tommy Smythe’s Houses and 26 Happy Yellow Rooms. Table, Elegant Garage Sale; Ralph Lauren plaid, Kravet; table colour, Babouche (223), Farrow & Ball. Soft yellow wallpaper warms up a large loft with exposed brick. Bold yellow paint adds punch to an otherwise traditional living room. The desire to reinterpret periods long past continues with a nod to neoclassical. In this new ode to a Grecian urn — as well as busts, vases and goblets — Palladian principles of scale and symmetry mix with fun colours, while decorative laurels, pearls and rosettes add authenticity. Black chairs and lampshades offer striking contrast to the yellow wall. Wall colour, Citrus, Sherwin-Williams; console, Funk & Gruven A-Z; chairs, HorseFeathersHome; tableware, vase, Cynthia Findlay Antiques; lamps, Era; shades, Aristocrat; bust, L'Atelier; carpet, Y&Co; stools, 507 Antiques; pillows, Sabrina Linn. Citrus-hued furniture adds a punch of personality to a raw loft. White-painted brick walls let the stunning architecture of this space speak for itself. The colour scheme was taken from Regina’s natural elements: wheat-yellow and leaf-green. Vintage film lights and and weathered metal accents contribute to the raw feeling of the loft, while cosy textiles and the fireplace make it livable. Find more inspiration in our photo galleries of Industrial Interiors and 26 Happy Yellow Rooms. Sofa, chair, Zanotta; floor lamp, Inform Interiors; metal storage cabinets, Bricault Design; pillows, throw, Linens 'n Things. A pop of colour in a mostly-white space. Elegant white wall panelling is the perfect backdrop for a yellow velvet French settee — a convenient place to tie shoes or drop handbags and keys. A paper lantern casts a welcoming glow. This bright principal bedroom has a comfortable, inviting vibe thanks to golden walls and a pink paper lantern, which casts a warm glow over the entire space. The homeowner gave the vintage dresser a fresh update with new hardware. In a unique take on wall art, a tiny illustration hangs on a ribbon inside an oversized frame. Wall colour, Stuart Gold (HC-10), Benjamin Moore. Accents like art and bedding add colour without committing to yellow walls. 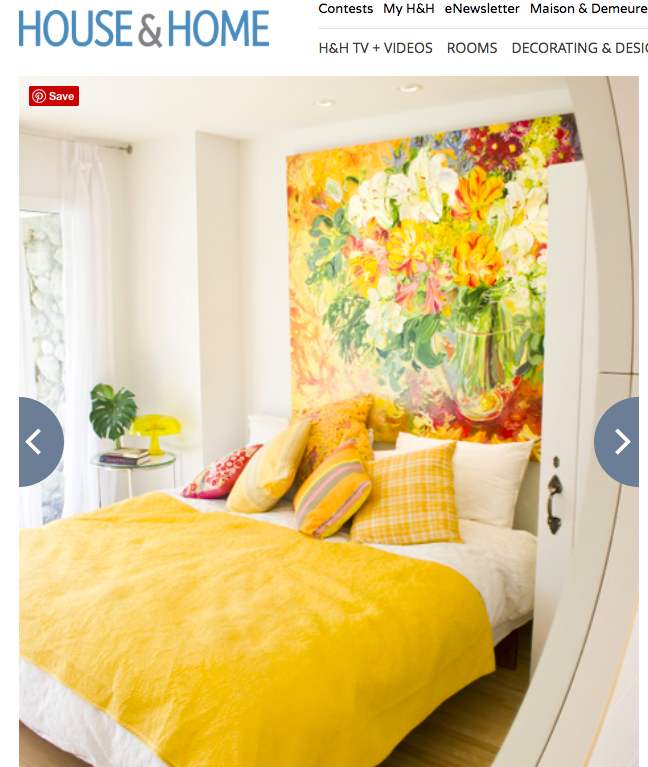 A bright yellow hue livens up a neutral bedroom. Bold canary yellow paint coats this vintage faux-bamboo chair, which can be placed in any room for a hit of cheery colour. Mirror, HomeSense; dresser, Casana; chair upholstery and refinishing, Mieda Design. An unexpected colour in a high gloss finish. A marble-topped folding island is a practical touch in this glamorous dressing room. Ceiling-height closets offer an abundance of storage and a delicate chair and vanity in front of the window offer a sun-drenched perch for accessorizing and applying makeup. Walls with simple white subway tiles call for a fun and playful wallpaper print above.